George Westinghouse was an American inventor, industrialist and engineer who was a pioneer in the field of railway transport and electricity. He was born in New York in 1846. Young George was a talented mechanic and helped his father in manufacturing agricultural machinery. The Civil War broke out when George was 15 years old and he enlisted in the New York National Guard, rising to the rank of corporal. He also joined the Navy for a year as an engineer. He enrolled at the Union College but soon lost interest in his studies, dropping out after only one term. His first invention, the Rotary Steam Engine, came at the age of 19. At age 21, he invented a device to guide derailed railway cars back on to their tracks. After witnessing a railroad accident where the drivers couldn’t stop in time, George invented a braking system based on compressed air which was patented in 1873. At that time, railway cars would have to brake manually, but George’s system was a failsafe automatic braking system. He formed the Westinghouse Air Brake Company to manufacture and sell his invention. His invention led to a dramatic drop in the number of railway accidents. He expanded his business in Europe, Canada and the USA by forming several companies such as “Union Switch” and “Signal Company”. He used his own inventions as well as others’ patents in his business. He was also deeply interested in the field of electricity. At that time, Thomas Edison was the main pioneer in the field and he vouched for the Direct Current (DC) model. Westinghouse obtained the exclusive rights to Nikola Tesla’s system of Alternating Current (AC) in 1888 and formed a company by the name of Westinghouse Electric Company to provide large scale electricity using the AC model. This idea was initially opposed by the public as well as Edison, as AC was thought to be dangerous, especially as it was used in the process of electrocution. However, Westinghouse persevered, and won a contract for the construction of 3 huge generators to harness electricity from the Niagara Falls. The generators were completed within 8 months, and became functional to supply power within a year. The Westinghouse Electric Company (later renamed Westinghouse Electric & Manufacturing Company) also won a contract for the entire supply of electricity during the Columbian Exposition in Chicago in 1893. Westinghouse introduced first AC locomotive in 1905, which was the groundwork for the New York subway system. He also acquired the exclusive rights to manufacture the Parsons steam turbine in America. By 1900, Westinghouse owned several businesses worth about $120 million at the time, employing more than 50,000 people. By 1904, he owned 9 manufacturing businesses in the US, another in Canada and 5 in Europe. 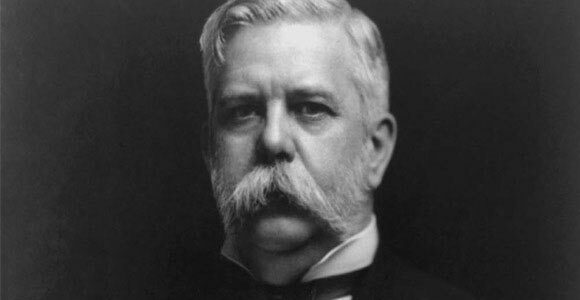 George Westinghouse lost a large amount of money in the 1907 financial crisis. His last major company was founded in 1910 to capitalize on the invention of a compressed air spring, designed to reduce the shock impact of automobile travelling. However, by 1911, he had renounced all interest in his former companies. The latter part of his life was spent in public service. Due to his deteriorating health caused by heart trouble, doctors advised him to rest. He was later confined to a wheelchair and died in 1914 at the age of 67. He held a total of 361 patents in his lifetime, with the last one being awarded four years after his death. His home was converted to “Westinghouse Park” (now named a national historic site) and “George Westinghouse Bridge” was also erected in his honor.